I was intrigued by this little book as I have a granddaughter who shares my love of nature and it is very difficult to find good books about nature, organic food, conservation, recycling, and ecology from a Christian perspective. 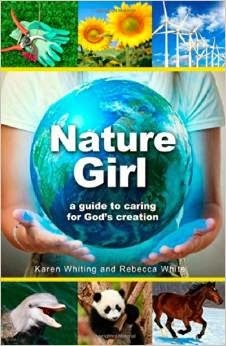 The authors, Karen Whiting and Rebecca White, have assembled a wonderful book full of information and ideas for young girls (and I may add, entire families) who want to study nature in its' many forms. Within the book are science experiments, games, and crafts, along with information for the reader in each section. It would be an excellent book for homeschoolers to draw activities from for their nature studies. This is not a big book and it contains no photos. But it is packed with a lot of information and activities. I highly recommend it! It would make an inexpensive addition to your family library. It is available in paperback and for the Kindle. This book was given to me by the publisher for the purpose of review but the opinion is my own. Oh my goodness, Brenda! I just came to your site to enter Amazon for one.last.Christmas.order, and I'm so glad that I did! I have an 8-year-old daughter who believes that God has given her a passion for nature so that He can use her for His purposes in the area of conservation. I've been wondering if there was any sort of book I could find for her on this subject from a Christian perspective. It sounds like this might be a good find for me! I'll be heading right to Amazon to take a closer look (and to place my order that will bless you in a tiny way!) :-) Thank you for writing this review! That sounds like a nice book. You're right that there are not many books about ecology etc, from a Christian perspective. While I do not believe in Global warming per se, I do believe that God gave us the work of stewardship over His creation. We should care about it and for it.